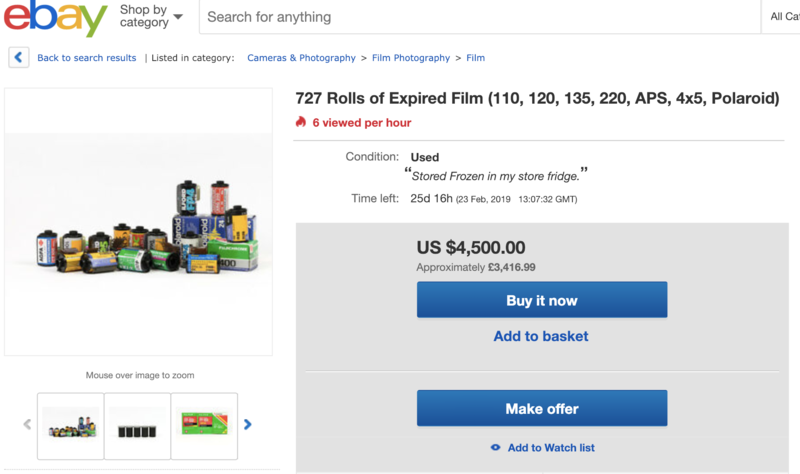 Film photographers in the know have long regarded eBay as the biggest expired film shop around. Photographers swapping film for digital, estate sales and camera shops clearing their bargain bins all contribute to a thriving subsection of film past its best-by date but still (hopefully) shootable. Kosmo Foto knows this only too well – many of the hundreds of rolls of discontinued film I’ve bought has come from eBay. But I’ve never seen one quite as big as one shared on Facebook earlier on Monday by Japan Camera Hunter. A seller in the Netherlands, Buymorefilm, is offering a lot of 727 rolls of film, a mix of 35mm, 120, 220, APS, 4×5 and instant film. The seller says in the listing: “Selling my collection of film…. Shop is discontinuing selling film.” All of the film has been stored in a film fridge, the listing states. It then details every single roll up for grabs – yours, for a Buy It Now price of $4,500 (£3,416). The seller is, however, open to offers. The listing is due to close on 23 February.